JOSEPH C. V. HRUDA ARCHITECT LTD.
DARRELL A. SWANSON ARCHITECT LTD.
BARRETT & JOHNSON ARCHITECTS LTD.
GROVES HODGSON PALENSTEIN ARCHITECTS LTD.
DALE M. TAYLOR ARCHITECT LTD.
GERALD L. FORSETH ARCHITECT LTD.
MICHAEL H.K. WONG ARCHITECTS LTD.
R. J. FELDSTEIN ARCHITECT LTD.
Remuneration by stage Stage 1: $ 40,000 to the four finalists and $ 5,000 to the four awards of merits. Stage 2: $ 100,000 to the winner (advance on fees) and $ 20,000 to the reserve winner. The City of Calgary is sponsoring an open Class 'A' two stage architectural competition in order to select the design and architect for the new Munici¬pal Building. The new Municipal Building will not exceed 72,230 m2 in gross building area. The primary function accommodated in the building is administrative, however, some legislative, public and special facilities are included. The City Hall and Administration Building are on the competition site and are to be retained and used to accommodate part of the program requirements. The rehabilitation of these two buildings is included in the competition in order to ensure a comprehen¬sive, integrated design solution. The City also wishes to develop public open space on the competition site. The design and the con-struction of this open space does not form part of the competition, however, the submissions must provide a location for this open space and demon¬strate its relationship with the City Hall and Admin-istration Building, and the new Municipal Building. The objective of the design competition is to obtain the best solution for the new Municipal Building judged against the program requirements outlined in the competition documents. Competitors should understand that while this is a competition for a major and important public building, it is not a competition for a new City Hall. The design of the new building must respect the visual and symbolic importance of the City Hall. It must also be in harmony with and complementary to neighbouring buildings, existing and to be developed, its context and environment. The quality of the submissions received from each of the four finalists in this two stage competition was outstanding. Each design was individual and imagina¬tive in its interpretation of the Sponsor's require¬ments and constraints. The Jury was particularly impressed by the extent to which its earlier sugges¬tions to the finalists, documented in Competition Document V - Jury Report, were considered in the final design submissions. The opportunity to make such recommendations and then evaluate how they have been incorporated in a more detailed submission is clearly one of the benefits of a two stage design competition. As was our practice during the first stage jury review, we have again been guided during our delibe¬rations by the competition documents outlining the city's requirements and constraints. We have again found, as we did in the first stage, that the detailed Technical Review, completed in advance of our adjudi¬cation was most useful, allowing us to focus on the architecture, context and overall resolution. In this final report, the reasons for selection of the winning design are given together with recommendations to the winning architect and Sponsor on areas requiring particular attention and change in order that the final design meet all of the Sponsor's requi¬rements and constraints. A similar explanation is given for the Reserve Winner and recommendations are again included. The Jury has recommended a number of detailed changes and in effecting these changes it is particularly important that the essential qualities of the design be maintained and enhanced. The voting members of the Jury, therefore, recommend that appropriate members of the City's Competition Management Team who are familiar with the exact nature of the Jury's concerns continue their involvement and assist the architect in interpretation of the Jury's views during the final design development phase. The comments of the Jury regarding the other two final submissions are also made in this report. Since this is the final competition document to be issued, the Jury believes that it is important that it contains a record of all submissions received. Accordingly, in addition to the finalists' submissions, a perspective and/or photograph of each submission selected as a Merit Award winner at the conclusion of the first stage has been included together with the names of all architects and their associates and consultants who made submissions in this competition. The members of the Jury are honored to have been able to participate in such a uniquely successful competition and wish to commend the City of Calgary for its commitment to the open and democratic achievement of design excellence. 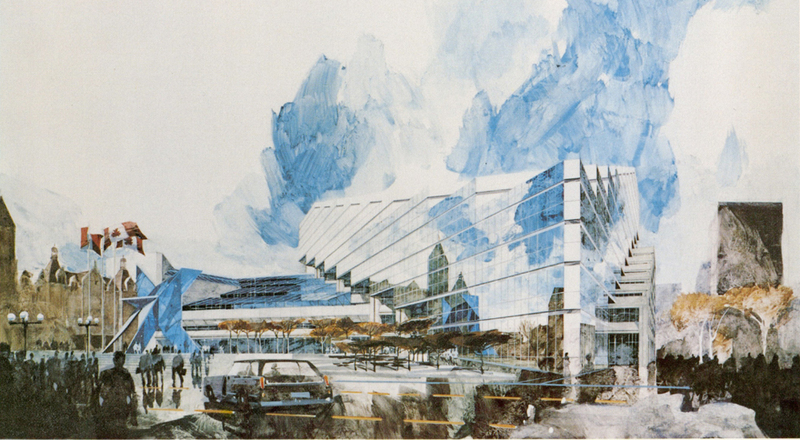 Submissions were received from the four finalists for this Final Stage of the two-stage competition to select the design of a Municipal Building in Calgary on November 27th, 1981. All four entries to this final stage met all mandatory presentation requirements consisting of drawings, report, models and submission form, as described in Document VI - Finalists Requirements. Upon acceptance by the Professional Advisor, the presentation material, together with the drawings of the First Stage of these four designs, were mounted for technical review and evaluation by the Jury. In addition to the Facility Program, Energy, and Cost Consultants, city staff from Building Regula¬tions, Development, L.R.T., and Structures and Building Divisions; the L.R.T. Consultants, the Project Manager, and the Construction Management firm retained by the City formed part of the Tech¬nical review team for this final stage. This team examined and reviewed in detail all four final submissions and prepared a Technical report for each design. The same members of the Jury re-convened for this final stage. The jury reviewed the terms of refe¬rence and objectives of the competition. Individual examination was undertaken by each member of the Jury of the presentation material with reference to the Technical reports. By a process of elimination, the Jury unanimously selected Finalists #101 and #102 for further evaluation. Following further discussions, detailed comparison of pros and cons, and conditions necessary for implementing either of the two designs, the jury unanimously selected #101 as the Winner, and #102 as the Reserve Winner.